Sample picture : 3/4 length pants made with Linen fabric in Grey. When I first saw this pattern constructed by Rae Hoekstra, it was love a first sight. I knew it would be perfect for my lil Akif. Practical with its rear panel for diaper wearing babies (both cloth and disposable) and super cute too :). 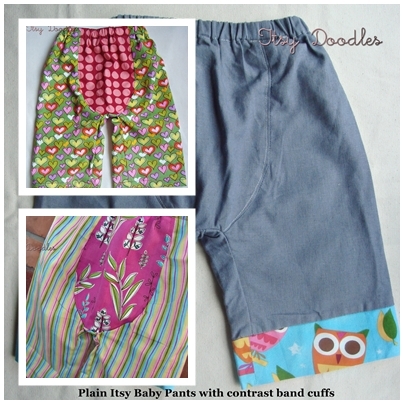 Now, your little ones can also have this cute pants in their wardrobe. For ideas on what design to go for the Itsy Baby Pants, please see the pictures below. 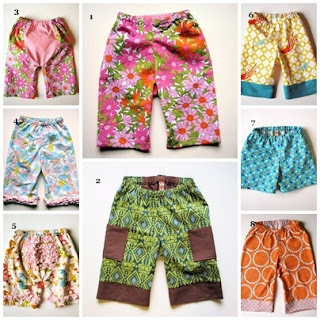 *Baby pants in these pictures were made by Rae Hoekstra. Main fabrics* choices for making these pants are cotton-linen in black, brown, grey, pink and baby blue, corduroy is black, dark blue, khaki and moss or soft denim in blue. As for the designer cotton*, you may choose from our fabric album here. Have an idea of your own for the Itsy Baby Pants? Forward them to us.